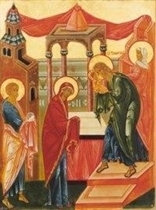 The Feast of the Meeting of the Lord is among the most ancient feasts of the Christian Church. Forty days after His birth, the God-Infant was taken to the Jerusalem Temple, the center of the nation`s religious life. According to the Law of Moses, a woman who gave birth to a male child was forbidden to enter the Temple of God for forty days. At the end of this time the mother came to the Temple with the child, to offer a young lamb or pigeon to the Lord as a purification sacrifice.